I had rebuilt my factory windshield washer pump once, but was never happy with it's performance, especially compared with any of the new vehicles in the driveway. For less than the cost of the gas to drive to the wreckers, I swapped in a tank and pump out of a '90's Chev truck. It works so well, the washer fluid sprayed over the cab into the box before I adjusted the nozzles down. And for a couple of bucks I repainted my bowtie to match the truck. fun night got me a new washer fluid bottle. new halo headlights I got recently...$38 plus shipping..one of the koolest things I ever put on my truck so far. where did you get those??? Those are awesome!!!! 06 Dodge Magnum 2.7v6 aka swag wag! This is one of my favorite threads! I recovered my dash like 1978chevybigten mentioned on the second page. Cost $37 for the fabric and glue. I haven't done this yet but I saw it in another thread. This place: http://www.automotivetouchup.com/ sells "touchup paint" in aerosol spray cans. They color match the factory paint that is on your truck. 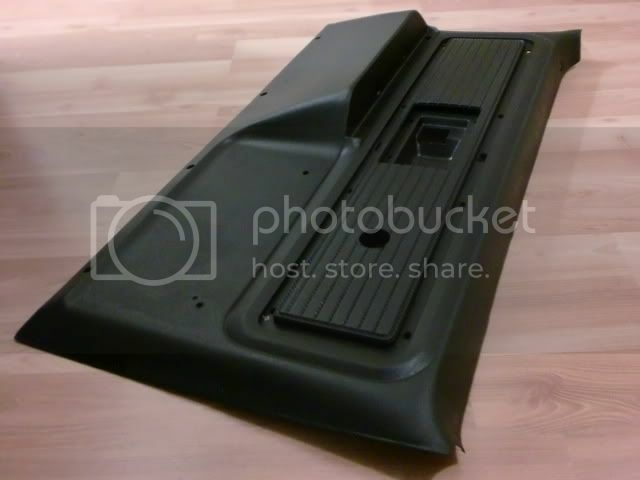 It seems like it would be great for smaller areas like rocker panels after rust repair. The basecoat cans are $20 and the clear cans are $8. I don't smoke so I cut the upper screen type thing and the little hook in the lower corner out of the ash tray. Then I sprayed the inside and the part of the outside that you see with Plastidip. It makes a great place for my iphone (or whatever). Plastidip is a very cool removable rubber coating. It's pretty amazing stuff. People are coating whole cars with it now. Anyway, I think the spray cans are around $8 at Lowes. I think this may have been mentioned already.... If you're steering shaft rag joint is causing your loose steering, you can swap in a Jeep XJ Cherokee steering shaft to eliminate the rag joint. It is a very easy swap for older square body trucks. The earlier trucks have a different steering column (changed around 1981) that makes it more difficult. The Jeep shafts are usually less than $50 at a junk yard. I needed tie downs in the bed but having them in the bed floor won't let me use a bed mat. I bought some stainless threaded rings and replaced the bottom bolt that attaches the front bed panel to the side panel. I backed the rings with some large washers and nylock nuts. These won't be for holding lots of weight. Just to keep things from rolling around or sliding out the back when the tailgate is down. Bump... Looking for more ideas! One of my favorite threads...let's see some more! Okay....I paid $20 at a swapmeet for a perfect leatherwrapped steering wheel from an early 90's S-10 Blazer LT. I scored a Theftlok GM CD player from a boneyard along with a 1990 Suburban instrument cluster bezel and with the radio harness adapter I had to buy new I had right at $50 in it all. That gave me a 1.5 DIN opening to keep it looking factory and allows me to plays CD's now. Another $50 upgrade/mod was the brushed silver instrument cluster overlay from LMC to finish the above mod. I Also scored buckets and console courtesy of a 1990 Suburban from a junkyard for $45 and after a couple power wash/scrub session it all looks brand new. This reminded me of another mod I did on my 86 K10-I used 88-91 Suburban wiper arms with the built-in washer spray nozzles and retainer-it keeps you from shooting fluid at the glass and instead flows along with the blades as they move up/down. Cost me $5 for the wiper arms at the junkyard. I bought a 73 Suburban recently and noticed it was backfiring on cold start. Check for spark and the spark seemed weak. then checked for voltage at the BAT terminal of the HEI...only 11.4Volts. Checked the voltage during cranking and it even dropped to only 7-8Volts. This is a common problem with old cars. 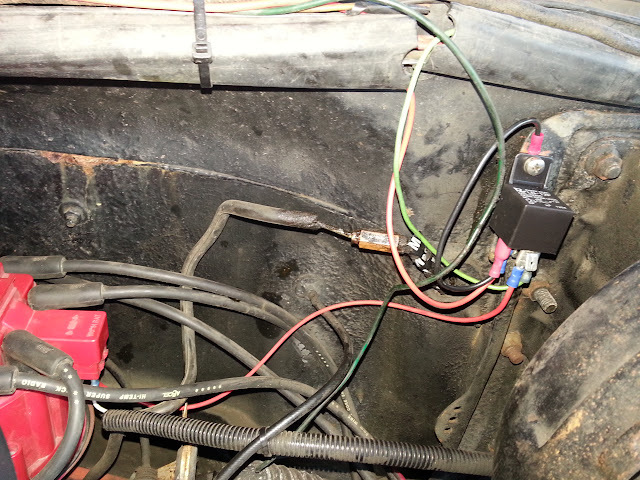 A lot of stuff runs of the IGN, but upgraded parts (like point to HEI ignition) and old wiring cause voltage drops. 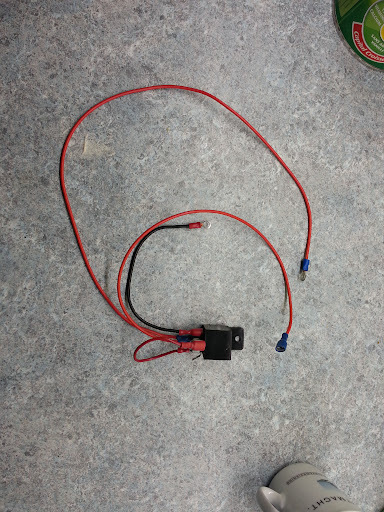 Solution is simple: use a relay to supercharge your HEI directly to your junction on the firewall where the alternator keeps the voltage at max.